As a highly experienced community midwife and teacher, Bridget Sheeran knows that pregnancy should be a time for vital physical and mental preparation. The body and mind do much of this automatically, but there are many ways to support this process and to resist the day-to-day stresses that can hinder it. In her book, Preparing for Birth: Colouring Your Pregnancy Journey, Bridget invites pregnant women to allow their natural curiosity to rise up and lead them to discover how they can help themselves through the process of birth. If you’re looking for a great gift for an expectant mother, ditch the helpful advice books and instead, get her something that will be truly appreciated. I was on my own in New York City, pregnant, working two jobs and facing winter. It was a pretty daunting time. People were so quick to recommend all manner of books I should read about pregnancy and birth and childcare that just trying to jot down the names was exhausting. It often felt that if someone recommended a book one day with one approach, the following day someone else would mention a different book with a completely opposite way of doing things. Put babies on their back. Put them on their tummy. Don’t let them cry. Do let them cry. Let them sleep with you. Don’t let them sleep with you. Do various forms of exercise before childbirth. Keep away from precisely those activities. It felt that if I started buying books I could disappear down a rabbit hole of conflicting advice so, in the end, I didn’t buy a single one. When I was given Bridget’s book as a gift, I dutifully opened the wrapping paper and expressed kindest thanks to the giver for such a thoughtful present, all the while thinking that it was highly unlikely I’d end up reading whatever was inside. So as not to be rude, I opened the book and immediately fell in love with the whole idea. A colouring book. Blooming marvellous. The perfect thing for banishing anxious thoughts and conflicting messages. How was this not the go-to gift for expectant mothers? As the pregnancy progressed and I stole quiet moments to colour in the charming pages, I found that I had my own instincts on how this would all play out. I just needed to create the space to let those thoughts form and flow and setting aside time for colouring and a cup of tea was the perfect catalyst. 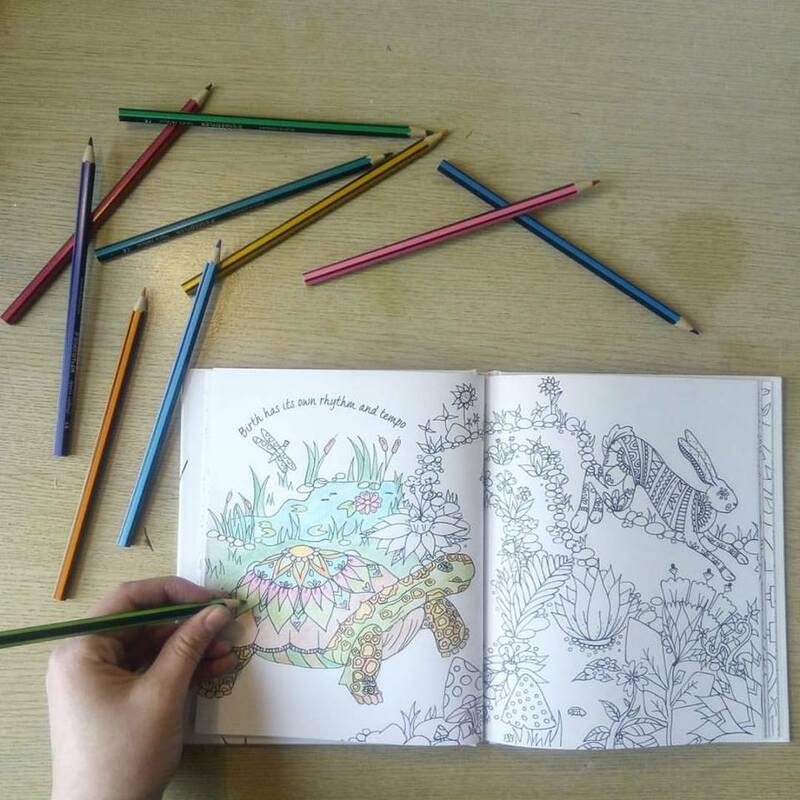 The tranquility of mind that comes with something as simple as colouring in cannot be underestimated and I’ll be buying Bridget’s book in future for anyone growing a little human.